Apple iOS smartphone and tablet users are 89% more likely to buy directly from their devices than Android users at 85%, per a study released Tuesday. Whether on an iOS or Android device, 47% of consumers participating in the study prefer to use a smartphone when shopping, with just 32% opting for a tablet. Analyzing responses based on mobile platform ownership and use between Apple and Android, the findings suggest that 51% of Android users prefer mobile shopping on a smartphone, compared with 48% of Apple users. Some 86% of Apple owners vs. 80% of Android owners are more likely to spend the same amount or more on holiday presents this year. Among those who own a mobile device, 73% plan to use them for holiday shopping, 97% to find the best deals, 96% to compare prices, 96% to research products, 92% to access coupons, 89% to find stores, and 85% to buy direct from the device. Retale, a mobile platform that connects shoppers with their favorite retailers locally, commissioned independent group Toluna Research to survey 1,000 U.S. consumers between Oct. 20 and 27, 2014 on how they use mobile devices to shop during the holidays. The study also looks at holiday season spending. Optimizing Web sites for location and directions has become equally important. Some 26% of survey participants will use their mobile device to find a store location. When asked where they would do their shopping, 22% said online only, 24% said brick-and-mortar retail stores only, and 54% said they would shop both online and in-store. For those who haven't noticed, consumers plan to get an early start on shopping this year. Some 25% began by deciding to shop year round, while 60% wait until November. About 31% start shopping around Nov. 1, with 29% waiting until the day after Thanksgiving, and 15% still wait for the last minute, per the study. 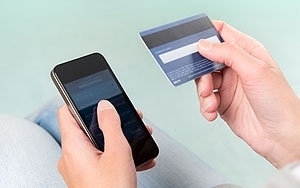 "Mobile Payment" image via Shutterstock.